From critically acclaimed novelist Bradford Morrow comes a richly told literary thriller about the dark side of the rare book world. The bibliophile community is stunned when a reclusive rare book collector is found on the floor of his Montauk home: hands severed, surrounded by valuable inscribed books and manuscripts that have been vandalized beyond repair. 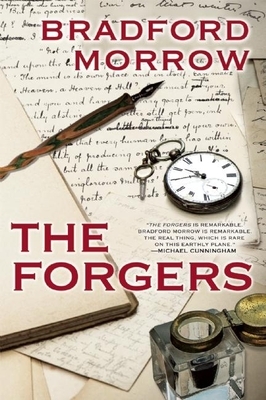 In the weeks following the victim's death, his sister, Meghan, and her lover--a sometime literary forger whose specialty is the handwriting of Sir Arthur Conan Doyle--struggle to come to terms with the murder. The police fail to identify a likely suspect, and the case quickly turns cold. Soon, Meghan's lover begins to receive threatening handwritten letters, ostensibly penned by long-dead authors but really from someone who seems to have disturbing insights into Adam's death. Understanding that his own life is in jeopardy, he attempts to forge a new beginning for himself and Meghan. But he may not be able to escape his vengeful stalker.